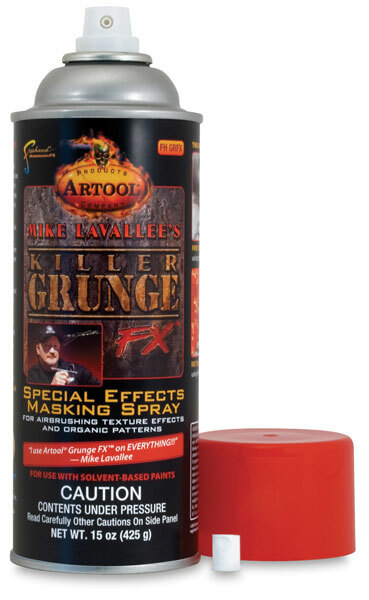 Created by celebrated airbrush artist Mike Lavallee, Artool Killer GrungeFX Special Effects Masking Spray is like a Freehand Airbrush Template in a can! Use it to turn your motorcycle, hot rod, or art project into a killer creation instantly. Killer GrungeFX lets you create random organic patterns and monster natural backgrounds with the press of a finger. Use either the Fat Splat or Fine Splat tip (both included) to achieve a myriad of one-of-a-kind textures. Simply shake the Killer GrungeFX can and spray it on your background, allowing it to separate, gap, and crack (it will enlarge quickly). Then, spray solvent-based airbrush colors over the Killer GrungeFX — letting the paints sink between the open gaps. Once the paints have dried, wipe away the Killer GrungeFX with a clean, dry paper towel and check out the awesome patterns left behind. ®Artool is a registered trademark.® Feehand is a registed trademark. ™ Killer GrungeFX is a trademark. ™ Fat Splat and Fine Splat are trademarks.